*This Treat is reposted annually. On Tisha B'Av, the ninth of Av, one of the ways that the Jewish people demonstrate their mourning over the loss of both Holy Temples is by refraining from Torah study that brings pleasure to those who study it. Therefore, it is considered appropriate to read only more somber texts, specifically: 1) Talmudic sections dealing with the destruction of the Temples, and the laws of mourning and excommunication (such as those found in the Talmud Moed Katan), 2) the Book of Job, 3) the admonitions and rebukes of the Book of Jeremiah, and 4) the Book of Lamentations. Tisha B'Av, the fast of the ninth of Av, begins at sundown tomorrow night. Click here, for more details on Tisha B'Av. This Treat was originally published on August 5, 2014. This Treat was last posted on July 24, 2015. Drink water today in preparation for the fast that starts tomorrow night. This Shabbat is Shabbat Chazon, the Sabbath of the Vision (prophecy), named after the opening word of the Book of Isaiah, the first 27 verses of which are read as the haftarah on the Shabbat before Tisha B'Av (the Ninth of Av). This Treat was last posted on August 1, 2014. Choose a food you consider special to include in your Shabbat meal. Only a single chapter in length, the Book of Obadiah is the shortest book of the Bible. It is, additionally, unique in that it addresses the nation of Edom (descendants of Esau) rather than the nation of Israel. Short as Obadiah’s recorded prophecy may be, the prophet himself had quite an interesting story. According to the Talmud Sanhedrin 39b, Obadiah served as the governor of the royal house of King Ahab (I Kings 13:3), who was one of the most wicked and ruthless rulers of the northern Kingdom of Israel. Obadiah might easily have fallen for the blandishments of idolatry and immorality. However, it is recorded that “Obadiah feared the Lord greatly” (18:4). In fact, the Talmudic sage Rabbi Abba even noted that “greater [praise] was expressed of Obadiah than of Abraham, since of Abraham the word ‘greatly; is not used, while of Obadiah it is” (Sanhedrin 39b). What singled Obadiah out for particular praise was an act mentioned twice in I Kings 18. “Was it not told, my lord, what I did when [Queen] Jezebel slew the prophets of the Lord, how I hid 100 men of the Lord’s prophets by 50 (separated into two groups) in a cave and fed them with bread and water?” (18:13). One of the most interesting facts about Obadiah’s life is that, according to Rabbi Meir as cited by his disciple Ephraim Maksh’ah, “Obadah was an Edomite convert” (Sanhedrin 39b), which was one reason that he was chosen to relay prophecy to the Edomites. Maintain your moral standards regardless of negative influences around you. For the “person-in-charge,” one of the most difficult, yet important, jobs is delegating responsibility. Choosing the men and women with whom one will work most closely requires knowing what the specific roles will be and exactly what qualities each of those roles require. In the wilderness, Moses started out assuming all the burden of leadership on himself. However, shortly into their sojourn in the wilderness, he accepted advice from his father-in-law, Jethro, and assigned a hierarchy of judges. The judges were brought from each tribe and were, according to Moses’ instruction, “wise men, and understanding, and well-known to your tribe, and I will make them heads over you” (Deuteronomy 1:13). Someone who is wise has a great deal of knowledge and perception. But, like the proverbial “wise man on the mountain,” enjoys that knowledge for himself, only sharing it with those who ask. Someone who has understanding, however, actively involves himself with the people around him, shares with them and learns from them. Moses instructed the people to find men who were both wise and understanding because he recognized that ideal leaders need to have a combination of both of these qualities. Use multiple character traits to assess the people you choose as role models. July 25th has an interesting and obscure designation on internet lists...it is listed as “Thread the Needle Day.” Most people who do not sew would agree that threading the needle is one of the most difficult aspects of the sewing process because of the diminutive size of the eye of the needle. On this day, in honor of all of those frustrated by sewing, Jewish Treats examines the metaphoric “eye of the needle” in Jewish texts. The first usage of the expression, in Talmud Brachot 55b, speaks of the idea of an elephant going through the eye of a needle as a metaphor for the impossible. This passage in the Talmud, which discusses dreams, quotes Rabbi Jonathan as saying “A man is shown in a dream only what is suggested by his own thoughts.” Raba supports this statement by saying: “This is proved by the fact that a man is never shown in a dream a date palm of gold, or an elephant going through the eye of a needle,” implying that this is because they are random and irrational thoughts. However, in the Midrash in Song of Songs Rabbah it is noted that at the Splitting of the Sea, God told the Children of Israel: “Open up for me an opening like the eye of a needle and in turn I will enlarge it to be an opening through which wagons can enter” (Song of Songs Rabbah 5:2). This is understood as a call for the Jewish people to reach out to God, and that if one turns to God (making a small opening in his/her heart), then God can do anything for them. These two separate thoughts actually merge to create a beautiful message of faith. One would not naturally dream of an elephant fitting through the eye of the needle, but even the impossible can be accomplished through trust in God. Don't hesitate to ask God for help in difficult situations. Lizzie Black Kander, who passed away on July 24, 1940, has been a household name for generations via the simple cookbook she created. The Settlement Cook Book (full title: The Way to a Man’s Heart...The Settlement Cook Book) was first published in 1901. The initial 1,000 copy run quickly sold out. It has now been through 34 editions, with 2 million copies sold. Leafing through the recipes included in the first Settlement Cook Book, one might puzzle over its Jewish connection, as many of the recipes feature non-kosher ingredients. However, the history of the book and its author are demonstrative of a very distinct era in American Jewish history. In the mid-19th century, a great wave of German Jews arrived in America, settled down, prospered and, in many ways, assimilated. When, at the end of the 19th century, great masses of Russian and Eastern European Jews came to America, the cultural and social-economic gap between the groups was enormous. Kander, like many upper-middle class women of her time, was dedicated to progressive reform. As a member of the Milwaukee Jewish Sewing Society (later, Milwaukee Jewish Mission) she became aware of the dire poverty of these new Jewish immigrants. She then got involved in Settlement House, a multi-purpose reform organization for Jews, where she taught cooking classes and incorporated lessons on nutrition and hygiene. When Settlement House struggled for funding, Kander proposed her cookbook, which the board rejected. She printed it anyway, and the revenue generated supported Settlement House for years (and eventually helped build the Milwaukee Jewish Community Center as well). At the heart of the cooking lessons and the cookbook filled with household tips was a desire to help those new immigrants become Americanized, which accounts for the non-kosher recipes. Yet it is interesting to note that a fair number of Jewish holiday foods, not included in the original, were added to later editions. If you see a non-kosher recipe that looks appetizing, see if you can substitute kosher ingredients. You may not believe this, but tomorrow, July 22, is National Hammock Day. It appears to be the ultimate celebration of the lazy days of summer. One might think that Hammock Day occuring on a Saturday is the ultimate fortuitous combination, what better way to enjoy the “day of rest” than by relaxing under the shade of the trees while gently swaying in a hammock. Today’s Jewish Treat, however, will take this as an opportunity to discuss some interesting issues concerning trees and hammocks on Shabbat. This prohibition makes it so that certain enjoyable outdoor activities require a bit of creativity, most notably, the question of a hammock or a child’s swing. To be “kosher” for Shabbat use, the hammock may not be directly attached to a tree, whether by nail or by rope. If, however, the hammock or swing is attached to a peg that is attached to the tree, this one degree of separation will make the swing or hammock acceptable for use on Shabbat, since placing one’s weight in the hammock has only an indirect effect on the tree. If the weather is pleasant where you live, spend part of Shabbat day outside enjoying the miracles of God's natural world. When Szmul Rzeszewski (1911-1992) was five years old, his father showed him how to play chess. Three years later, the boy was a recognized child prodigy who gained acclaim giving simultaneous chess exhibitions against multiple opponents. That same year, his family moved from Poland to America. Young Sammy began touring the county playing exhibition games in places such as West Point Military Academy, Hollywood (playing against Charlie Chaplain) and even Washington, D.C. In November 1922, however, the grand tour came to an end when a late-night exhibition drew the attention of child welfare authorities, who were not at all pleased that Reshevsky (as he later Americanized his name) was not attending school. Julius Rosenwald, co-owner of Sears, agreed to be his benefactor if Reshevsky agreed to complete his education. Reshevsky went on to graduate from the University of Chicago School of Business with a degree in accounting, the profession by which he would later support himself and his family while still competing in chess. When Reshevsky returned to competitive chess, he immediately began placing in the top tier of international chess players. In 1936, he won the U.S. Chess Championship, which he also did in ‘38, ‘40, ‘41, ‘42, ‘46 and ‘69 (and tied in ‘72!). In 1948, Reshevsky was one of five hand-picked competitors to replace the late World Champion, Alexander Alekhine. Although he did not win, it was a special distinction to even compete for the title. Reshevsky never succeeded in attaining an international title, but was continually recognized as one of the world’s most talented players. In the history of chess there have been many outstanding Jewish players (including his later great rival, Bobby Fischer). Reshevsky, however, was unique. Devout in his observance, Reshevsky never once competed on Shabbat. Samuel Reshevsky, who was also known for his chess writing (column and books) competed far later than many other chess grandmasters. His last competition was in 1988, four years before he passed away at age 80. Today, July 20th, is International Chess Day. If you are athletic, use your abilities to help raise money for important causes (marathons, bikeathons, etc). The taking of a human life is always a tragedy, and there is never a way to actually make it alright for the loved ones of the victims. In situations of unnatural death, there are several layers of culpability. In contemporary terms, there is murder, which is the deliberate taking of another’s life, criminally negligent manslaughter, which is an act that was not intentional but for which someone is responsible, and unforeseen death, which is an unintended act that could not have been prevented. The Torah has a unique system for dealing with manslaughter. The person who caused the accidental death immediately flees to one of six special cities known as arei miklat, cities of refuge (click here to read more), or to one of the other 42 cities of the Levites. The following go into banishment: He who slays in error. If, while he was pushing a roller [on the roof], it fell down and killed somebody, or while he was lowering a cask, it fell down and killed somebody...He goes into banishment. But if, while he was pulling up the roller, it fell back on someone, killing him, or while he was raising a bucket the rope snapped and the bucket killed somebody in its fall...He doesn’t go into banishment...This is the general principle: whenever the death was caused in the course of a downward movement, he goes into banishment, but if it is caused not in the course of a downward movement, he does not go into banishment (Talmud Makkot 7a-b). The general idea is that there are different levels of culpability involved in an accident. The subtle nuance of a person’s movements at the time of the incident can determine whether the person should take refuge in an ir miklat or not. Needless to say, each case needs to be considered individually. It is, however, fascinating to note the subtle parameters set in this passage of the Talmud, which continues on through a series of very complex situations and discussions, as the sages sought to ensure justice for all. When using large tools, always make sure the safety features are set and make certain to put the tools safely away when finished. Is it okay to malign the leader(s) of the country? In the United States, the concept of freedom of speech allows for a great range of political commentary and criticism. Whether this is good or bad for American society is a question best left to private opinion, but the narrative in today’s Treat demonstrates that even the greatest leaders of Israel faced challenging criticism. There is an interesting correlation to this issue in the Tanach. In the Second Book of Samuel, Chapter 16, the Torah describes a disturbing incident in which a man named Shimei ben Gera angrily maligned King David. Shimei was from the House of Saul, the king whom David succeeded. King David was traveling through the territory of the Tribe of Benjamin and “as he (David) came, he (Shimei) cursed him continually. And he cast stones at David and at all the servants of King David” (II Samuel 16:5-6). Shimei’s words were harsh and angry: “Come out, come out you bloody man, you wicked man. God has returned on you all the blood of the House of Saul in whose stead you have reigned. God has delivered the kingdom into the hands of Absalom your son, and, behold, you are taken in your mischief because you are a bloody man!” (ibid. 8). David’s companion, Avishai, took great umbrage for him. He wished to punish Shimei immediately, but David stayed his hand, stating: “Let him curse, for God has bidden him to do so” (ibid. 16:11). This incident occurred in the midst of the attempted coup of David’s son Absalom. When David was returned to his throne, Shimei came and begged forgiveness, and David let him live. According to tradition, Shimei went on to become a teacher of David’s son and heir, Solomon. However, the fact is that Shimei’s cursing of God’s anointed king was a grave transgression, and before he died, David instructed Solomon to “hold him not guiltless; you are a wise man and you know what you ought to do” (II Kings 2:9). Solomon put Shimei under house arrest, which he violated. His disobedience of the king’s order lead to his death by execution. Speak politely when arguing your point. In the age of the internet there are an incredble number of new “holidays.” This week alone we “celebrate” National Caviar Day (18th), Moonday (20th) and National Junk Food Day (21st). In 2014, an Israeli non-profit organization, Made in JLM (which works with Israeli start-ups) decided to create a new international holiday that they named International Firgun Day. The chosen date was July 17th. Firgun, according to several internet definitions, means: "(pronounced feer-goon, from modern Hebrew) a genuine, unselfish delight or pride in the accomplishment of someone else; giving credit where it is due, fairly and without jealousy." A firgun is the ideal of a compliment as it looks fully at the other person with no ulterior motive and with a depth of recognition of the other person’s character (as opposed, for instance, to “I like the shirt you are wearing”). Firgun is not a native Hebrew word, but rather a slang that evolved from the Yiddish word firgenun. As with so many cross language words, there is no singular English term that translates either firgenun or firgun, but that does not mean that International Firgun Day cannot be celebrated by all. At the heart of the concept of firgun is the idea of an ayin tova, a good eye. Having a “good eye” means looking to see the positive, and it is a trait listed as one of the basic attributes a good person should have (Pirkei Avot /Ethics of the Fathers 2:10). Seeking joy in other people’s lives inevitably makes multiple people happy, thus bringing peace, shalom, to the world. Make an active effort to look positively at the actions of your coworkers. Ever hear someone count out loud in the negatives: "Not one, not two, not three..." It may seem, strange, but in many traditional Jewish communities this is a common method for counting the number of people present. Counting in this seemingly awkward manner avoids the prohibition of conducting a census of individual Jewish people. Rabbi Eleazar said: Whosoever counts Israel, transgresses a [biblical] prohibition, as it is said (Hosea 22:1): ‘Yet the number of the children of Israel shall be as the sand of the sea, which cannot be measured’” (Talmud Yoma 22b). Despite the verse, throughout the rest of the Torah there are a number of references to Divinely ordained censuses of the Children of Israel. The most well-known census, and the most informative of proper process, is that of the half-shekel (Exodus 30:11 - 16), when every male above the age of twenty each gave identical half-shekel donations which were then counted in order to know the number of Israelites. Additionally, any type of census can only be done for a valid reason, such as counting those of age suitable for service in the army (Numbers 1:2-4). Counting individuals singles them out, and numbering people focuses attention on them. The Medieval commentator Rashi explains that “ayin harah (literally the evil eye link) has power over numbered things” (on Exodus 30:12), which is an expression of a fear of consequences in the higher worlds because of undo attention. The custom, therefore, is to try to avoid spotlighting individuals whether counting them as a nation or even counting to achieve the requisite quorum for prayers. Sometimes, however, it is necessary to count a group of Jews. Most frequently, this is true when trying to assess whether one has a complete minyan (quorum of ten) to allow communal prayers to take place. A common method for counting a minyan is to recite a Torah verse of ten words (often Psalms 28:9: "Hoshee’ah et am’echa u'varech et nachalatecha ur'em venas'em ad ha'olam/Save Your people and bless Your inheritance, and tend them and elevate them forever–associating each of the ten words with a person. Enjoy Shabbat with friends and family. Born on July 13, 1894, in Odessa, Isaac Babel’s life spanned a tumultuous time in Russian history. Raised in a middle class Jewish home, Babel had both a full Jewish education and a robust secular education. However, in two separate instances he was unable to attend the school of his choice because of quotas on Jewish students. In 1915, Babel moved to St. Petersburg, although this was against the law restricting Jews to live only in the Pale of Settlement. In St. Petersburg, Babel met the Russian writer Maxim Gorky, who had a tremendous impact upon his life. After the October Revolution, Gorky gave him a job at his Menshevik newspaper. Babel’s first collection of short stories, The Story of My Dovecoat, was published in 1925. Its eponymous story is an autobiographical narrative of surviving a notorious pogrom. His fame was sealed with his next book, The Red Cavalry, which was an honest look at life in the military. His writing was praised for both realism and simplicity of language. Babel’s third book of short stories, Odessa Tales, presented an array of interesting residents of a ghetto in Odessa. The characters were complex, perhaps because they were far from perfect. One of his most notable characters from this collection was Benya Krik, the chief gangster of the ghetto. While Socialist Realism was in vogue at the beginning of the Soviet Union, the ascension of Joseph Stalin to the head of the Politburo left little room for the possibility of subversiveness. Babel continued to write, and Maria, his play about both sides of the October Revolution, drew particular attention from the Soviet secret police and was pulled before ever opening. In 1936, Maxim Gorky died mysteriously, and Babel recognized that his own safety was now also in question. In 1939, the secret police arrested him and he was executed as part of Stalin’s great purge. Bring kosher snacks to share with your coworkers. Today marks the 42nd anniversary of the independence of the islands of Sao Tome and Principe from Portugal. The islands, which are located off the western coast of Africa, were mostly uninhabited until the Portuguese arrived in the late 1400s. Their tropical climates made them ideal for growing commodity crops such as sugar but also made them unattractive to ordinary settlers (crocodiles and all that). In 1492, as Jews poured across Portugal’s border, driven by the expulsion order from Spain, Portugal’s King Manuel had a creative and horrific solution to his problem – populate the islands of Sao Tome and Principe with Jews. Not long after the refugees arrived, King Manuel placed a tax upon them. Many of these Jews had been forced to leave Spain without any assets and could not pay. In lieu of taxes, the king took their most precious possession:--their beloved children. Over 2,000 children between the ages of 2 and 12 were taken from their families, forcibly converted to Christianity and sent to serve as slaves on the remote islands. The sea journey was difficult and life on the island was harsh. A year after transport, only 600 of the Jewish children survived. Little is known about the individual lives of the kidnapped children but it appears that, although they intermarried, their descendants remained a distinct group among the island’s population. As in many places where the conversos settled, Jewish rituals were subtly integrated into the dominant culture. While most of the descendants are no longer on the island, an international conference on the transported children was held on July 12, 1995, the country’s 20th anniversary. This act is sometimes attributed to his predecessor, King Joao II. Dedicate some of your philanthropic funds to supporting orphans and chldren in need. As described by Rabbi Eliyahu Kitov in The Book of Our Heritage, when the Babylonians began their siege of Jerusalem, the Jews still had enough livestock within the walls to maintain the tamid offering. As the siege continued, however, the priests of the Temple struggled to maintain the Temple service. They even sent baskets of silver and gold over the Temple wall to buy sheep for the offerings from the Babylonians. On the 17th of Tammuz, however, the basket was returned to them empty - there were no more sheep to be purchased, and so the daily offerings came to an end. Needless to say, the cessation of the daily offering was a significant blow to the morale of the people of Jerusalem and the entire nation. This Treat is reposted semi-annually. NJOP wishes you an easy and meaingful fast. Everyone knows about Yom Kippur. 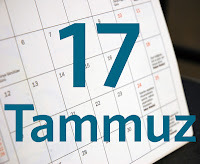 There are, however, several other fast days on the Jewish calendar that are not nearly as well known, including the Fast of the 17th of Tammuz, which will be observed tomorrow. 5. Apostamos (a Roman general) publicly burned a Torah scroll. Eat sensibly to prepare for tomorrow's fast. Since the earliest days of record, women have spent time “doing” their hair. While some generations have favored simple styles (like the “bob” of the 1930s), others relished incredibly intricate “dos.” Throughout every phase, however, the braiding of hair has always been both practical and popular. For Jews observing the laws of Shabbat, hair care can require a little more thought. For instance, one must be careful about pulling hair out, which is considered similar to the prohibited act of shearing. Therefore, when brushing on Shabbat, one should use a soft-bristle brush. “She who plaits [on Shabbat, is liable for violating] the prohibition of building. Is this then the manner of building?-Even so, as Rabbi Simeon ben Menassia expounded (on Genesis 2:22): And the Lord God built (yee'ven, from the same root as boneh) the rib [. . . into a woman]: this teaches that the Holy One, blessed be He, braided Eve[’s hair] and brought her to Adam, for in the sea-towns braiding is called ‘building’” (Talmud Shabbat 95a). While this may seem like a fanciful interpretation, it actually presents several important concepts. The first, in relation to Shabbat, is the connection of braiding to building on Shabbat. The second, however, is the importance of shalom bayit (peace in the house), for God took the time to help Eve prepare herself before being introduced to Adam. Distinguish between Shabbat and weekday by the way you dress. If you have ever had a life-endangering moment - a car accident, a severe illness, etc. - then you will remember the flood of emotions that come with the knowledge that you were saved from death or great harm. Chief among these emotions is gratitude, and the sages instituted a specific blessing, known as Birkat Hagomel (Bentching Gomel in Yiddish), to be recited after just such an event. “Rav Judah said in the name of Rav, ‘There are four [types of] people who have to offer thanksgiving: those who crossed the sea, those who traversed the wilderness, one who has recovered from an illness, and a prisoner who has been set free’” (Talmud Brachot 54b) These four categories are each connected to a quote concluding with an instruction to give thanks to the Lord for His mercy (Psalms 107: 23-31, 4-8, 17-21 and 10-15). These four types of people are known in the Jewish literature by the acronym “Chay’yim” (which in Hebrew literally means life): Ch’avush - a former prisoner, Yam - one who crossed the sea, Y’isurim - one who suffered illness, M’idbar - one who crossed the desert. The Talmud states that one should declare a brief blessing, “Blessed is He Who bestows loving kindness” (ibid. ), but the actual blessing that is recited is, “Blessed are You, Lord our God, King of the universe, Who bestows good upon the guilty, even as He has bestowed to me every good.” This blessing is recited with a minyan (a prayer quorum), and it is best if that minyan includes two Torah scholars. The prayer itself is usually recited during the Torah reading service. Defining Chay’yim (the four categories) in the modern age has a lot to do with the traditions of one’s community. In some communities, a single day in a sickbed is considered ill enough to recite Birkat Hagomel, in others it is three days. Some make the blessing after any travel, others have very specific specifications. If one thinks that they have a reason to recite Birkat Hagomel, they should consult their local rabbi. Use common sense and follow safety instructions. “How glorious are your tents, Jacob, your dwellings, Israel. As valleys stretched out, as gardens by the river-side; as aloes planted by God, as cedars beside the waters” (Numbers 24:5-6). These words of praise came from one of history’s most notorious enemies of the Jewish people: Balaam son of Beor. Balaam was known throughout the ancient world for his great spiritual powers. Able to “tap into” the supernatural forces of the world, he knew the most auspicious times to make Divine requests. Anyone cursed by Balaam was firmly cursed. Balaam was approached by Balak, King of Moab, to curse the Israelites who were camped at his border. Balaam hesitated, knowing that God favored the Israelites. But when asked a third time, he agreed. On his way to Balak’s palace, an angel of God tried to block Balaam and dissuade him from his task, but Balaam’s mind was set. On a cliff overlooking the camp of Israel, Balaam warned Balak that, try as he might, he could speak only the words that God put in his mouth. Balaam tried three times to curse the Jews, moving from one place to another and failing each time. Each curse that he tried to utter turned into a blessing. One might think that Balaam’s failure to curse the Jews indicates that he was not so wicked. However, after failing in his attempted curses, Balaam (according to the tradition recorded in Talmud Sanhedrin 106a) recommended to Balak that he send out beautiful Moabite women to seduce the Jewish men, for only when the Jews degraded themselves morally could they be defeated on the battlefield. This time, Balaam’s wicked strategy resulted in many Jewish casualties. This Treat was last posted on July 2, 2009. When dealing with a confrontation, think carefully about the words you speak. What was the highest rank obtained by a Jewish soldier during the Revolutionary War? The answer is Lieutenant-Colonel, by order of the Executive Council of Pennsylvania, to Solomon Bush. Born in Philadelphia in 1753, Bush was an ardent patriot (as was his father, Mathias, who signed the 1765 Non-Importation Agreement following Britain’s Stamp Act). Bush’s contribution to the war effort was to join the Pennsylvania militia, where he was appointed Deputy Adjunct-General. In September 1777, at the Battle of Brandywine, Bush was severely wounded and, briefly, taken prisoner by the British. He was paroled and brought to his father’s house to recuperate. His wounds were serious enough that he could not return to battle and even had trouble earning a living. In October 1779, the Executive Council of Pennsylvania promoted him to Lieutenant-Colonel to grant him that rank’s pay and rations. Following the war, Bush appears to have been eking out a living, sometimes as a doctor. It is known that he spent some years in London, from where he sent several petitions to President George Washington asking to be appointed to a diplomatic position. In some of his communications, he offered information on political acts, such as Britains impressment (forced service) of American sailors. He was never given an appointment. Take a moment and reflect on the positive history of Jews in America. The story of St. Estatius, a small Caribbean Island, brings together a remote location, the American Revolution and Jewish history. It is one of those strange tales Jewish Treats loves to share. St. Estatius (a Dutch holding) was a free port (no customs duty) and major shipping hub, as well as a notorious point for contraband. It was also the source for munitions-trading for the colonists. As a mercantile center, St. Estatius also had a significant Jewish population of both Sephardim and Ashkenazim. Their synagogue, Honen Dalim (“The One Who Is Charitable To The Poor”), was completed in 1739. Both the British and the Americans recognized that the St. Estatius supply line was critical, In 1781, after Britain declared war on the Dutch, Britain ordered Admiral Sir George Brydges Rodney and Major-General Sir John Vaughan to attack St. Estatius and St. Martin. When Admiral Rodney appeared with 15 heavily armed ships, the island surrendered and the looting began. Immediately, Rodney confiscated all the merchandise stored in the island’s warehouses. He also ordered all foreign merchants to return to their native lands. All male Jews, however, were deported back to England with one day's notice and without their families. Rodney even had each man’s jacket torn open to make certain that no gold had been hidden in the lining. Additionally, Rodney burned down Honen Dalim, the synagogue--the walls of which remain standing to this day. Rodney remained on St. Estatius until the end of 1781. It has been suggested that he was so busy looting the island that he neglected to prevent the French Fleet from attacking the British Navy, which hindered General Cornwallis from receiving the support he needed at Yorktown...and thus we have a piece of history about a Caribbean island, the American Revolution and the Jews. This Treat was last posted on July 5, 2010. Don't be surprised when Jewish history and American history overlap.